Toronto, Canada -- Hailing from the Greater Toronto, Canada area, the Powerhouse Fellowship Soul Choir is a group of young adults with a passion and goal to change lives through music. Fondly referred to as POWERHOUSE, the choir was formed in 1986 for a church building fund program. In 1988, the choir was officially founded and began to be directed under the leadership of Shawn Cotterell. POWERHOUSE has been invited to be part of several major events in the United States including Bishop Hezekiah Walker's Choirfest in Las Vegas, NV (during Stellar Awards week) and has performed with Gospel Music greats CeCe Winans, Pastor Shirley Caesar, The Clark Sisters, and with multiple Grammy-winning legend Stevie Wonder. They have also performed with world-renowned Juno Award-winning Opera soprano Measha Brueggergosman on her "Songs of Freedom" tour. POWERHOUSE are winners of the 2015 Black Canadian Awards for the "Best Gospel Group" category, the 2016 Gospel Blue MIC awards "Choir of the Year" category and "EP/DIGITAL ALBUM OF THE YEAR" for the 2017 Radio Alliance Awards. 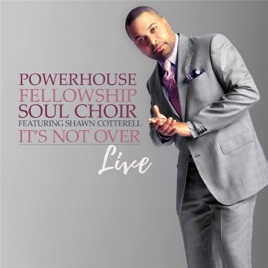 Celebrating the choir's successes but remaining true to the call of ministry, POWERHOUSE released their IT'S NOT OVER: LIVE album in 2018. IT'S NOT OVER: LIVE features POWERHOUSE alumni and former EMI Gospel recording artist Londa Larmond on the choir's most requested single "I Choose To Rejoice" and R&B Canadian Idol finalist Toya Alexis on "Unexpected Gift". The album is a sensational mix of high energy praise and delicately executed worship. And, for the Urban contemporary music fan, POWERHOUSE delivers a bass bumpin', R&B infused track "The Remedy" lead by the soulful trio of Larmond, Alexis and Patricia Shirley.